One of the points which speed camera supporters use to try to refute arguments that governments want speed cameras only because they make money, is that in Maryland the money is supposed to be allocated to specific purposes. We previously demonstrated that the restriction written into state law that speed camera money is to be spent only on "public safety" was completely meaningless, because local governments were free to re-define this to include whatever budget items they wanted. requires DSP to offset speed monitoring revenues in excess of $5.0 million with a general fund reversion." In other words, if the project makes just a little money, spend it on the purpose required by law. But if it makes LOTS of money, cut the specified budget by an equal amount, and then use the remainder to help Governor O'Malley close the state's looming general fund budget gap. Never mind that doing so might well violate state law, or at least that it provides yet another example of how ALL the restrictions built into the state's speed camera law are in fact unenforced or unenforceable and serve no purpose other than for public relations. 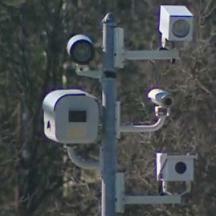 The state's freeway work zone speed camera program is still a pilot project, utilizing only two mobile units so far. According to the document, the Maryland State Police have entered a temporary contract which will expire in June 2010 and are reviewing proposals for a permanent contract, which would allow a full blown program to get into full swing right about the time state officials have cleared the 2010 elections.